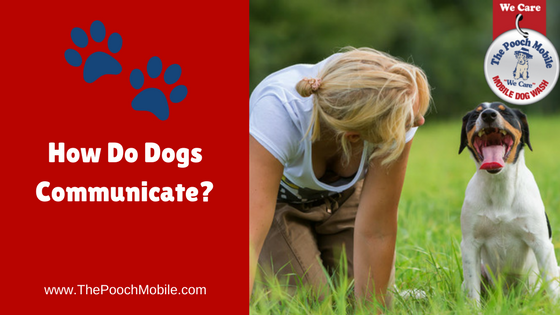 Have you ever wished your dog could talk to you? Well, he does. Just not with words. Research shows that dogs have their own way of communicating with their owners, as well as with other dogs. We send our dogs to obedience school to teach them how to understand what we want from them. But they also need to tell us what they need from us, and they do so every day. We simply have to open our eyes, ears, and hearts to understand what they are trying to say. Any dog owner will tell you that their furry family member speaks volumes about their bodies. Dogs will wrinkle or straighten their foreheads to show confusion or determination. A dog’s eyes brighten when he looks at a creature he considers friendly. When he is afraid, his pupils dilate and he shows the whites of his eyes. If your dog is happy or wants to play, he may pull his lips back and show his teeth in what appears to be a smile. This is a gesture that is reserved only for human/dog communication; a dog will not do this with other dogs. If a dog’s ears are raised, he is relaxed or listening. If they are back, he might be signaling submission. Dogs are social animals, and there is a universal language they share when communicating with other dogs. This is like a human coming up and slapping you on the back. This gesture puts the dog at an awkward angle, so it’s also a sign that the dog trusts the dog it is playing with. When dogs rear up on their hind legs, it’s a sign of affection. It often looks like dancing when dogs do this together when they’re playing. Again, it’s a sign of play. Dogs are careful to avoid sensitive areas of the other animal. Just like their human owners, dogs like to talk. However, unlike body signals, barking can represent different things to different dogs. Delicious Peanut Butter Treats You Can Make for Your Pooch!